As far back as anyone can remember, Lee Herring was sketching and painting and looking at the world with an artist's eye, interpreting what he saw and saving it as art. As a child, he mimicked illustrations and cartoons from magazines and sketched the images captured in photographs. He constantly trained both his hand and eye and this determination is evident today in his highly realistic paintings of historical and western significance. Herring was born in rural Rains County, Texas, at the home of his maternal grandparents. He played high school football and went on to captain a nationally-ranked junior college conference champion team. At what became Texas A&M Commerce, he played college football while he earned both bachelors and masters degrees. After graduation, he circled the globe teaching in Gilgandra and Sydney, New South Wales, Australia, earned his pilot's license, lived in Guadalajara and Portland then returned to his native Texas to teach in Waco and Richardson. He has been featured in numerous art, education and consumer publications. 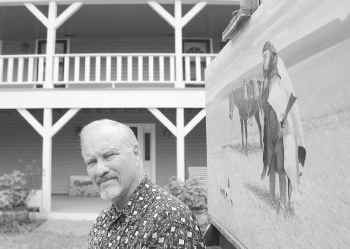 After a successful stint as an illustrator, Herring devoted himself full-time in 1975 to producing epic paintings of the American West, Texas history and the traditional western scenes for which he has become so well known. Recently, Herring has answered the demand by adding portraits in both oil and watercolor to his achievements. As evidenced by the scope of his work, he captures the gentleness of a child with the same adept eye that interprets a corporate officer and an award-winning animal. His commissions for portraits are growing and include both the powerful and the poignant. A Lee Herring painting is readily recognized by the artist's commitment to historical accuracy - he travels to the places he depicts and researches every component. His paintings are starkly realistic yet highly individual, traditional subjects molded by the artist's interpretation. One can almost smell the campfire smoke and feel the fog rolling in from the plains. He is a master at capturing ominous rain clouds, blistering desert heat and both the innocence and intensity of an earlier rural America. And, Herring is at his best depicting the conflicts in life's conditions: Native American and western frontiersman, wild beasts and burdened domestic animals, placid waterfalls and roiling weather. Herring brings that period of history alive with his depiction of the American West's exuberance, the textures and essence of America's growth towards the west coast.